Struggling to find room for everything in your kitchen or your bathroom? 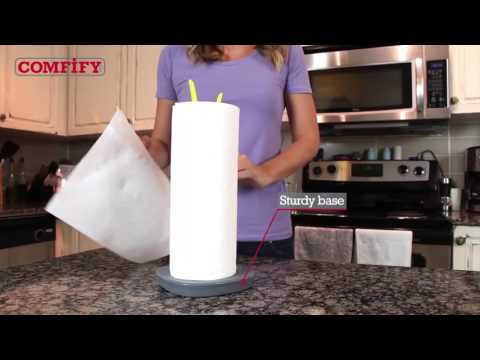 The “Sprout” Decorative Paper Towel Holder & Toilet Paper Holder by Comfify is the perfect vertical countertop or floor stand for functional spaces. Cute design is simple and appealing: the “Sprout” Decorative Paper Towel Holder & Toilet Paper Holder fits in just about any style kitchen, including contemporary, traditional, classic cottage, French country, modern, Tuscan and more. This paper towel stand for the kitchen also offers superior functionality. Rubber foot provides no-slip grip that prevents accidents. The base is heavy and designed for easy grabbing and tearing of paper towel sheets, with no fumbles. 2-in1 functionality means this works just as well in the bathroom! “Sprout” design prevents accidental unrolling. The “Sprout” Decorative Paper Towel Holder & Toilet Paper Holder by Comfify is elegant and versatile enough to have a place in any bathroom! Shopping for someone else? The “Sprout” Decorative Paper Towel Holder & Toilet Paper Holder is a perfect gift item. It makes for a very welcome wedding present or housewarming gift. GIFT-FRIENDLY WRAPPING - This paper towel holder/toilet paper holder makes a wonderful housewarming present, wedding gift, or something special for anyone who loves their home! © 2018 Comfify. All Rights Reserved.